We recently reported that novel ring-substituted analogs of 3,3′-diindolylmethane (ring-DIMs) induce apoptosis and necrosis in androgen-dependent and –independent prostate cancer cells. In this paper, we have focused on the mechanism(s) associated with ring-DIM-mediated cell death, and on identifying the specific intracellular target(s) of these compounds. The 4,4′- and 7,7′-dichloroDIMs and 4,4′- and 7,7′-dibromoDIMs induced the death of LNCaP, C42B and DU145 prostate cancer cells, but not that of immortalized normal human prostate epithelial (RWPE-1) cells. Ring-DIMs caused the early loss of mitochondrial membrane potential (MMP) and decreased mitochondrial ATP generation in prostate cancer cells. Cyclosporin A, an inhibitor of the mitochondrial permeability transition pore, inhibited ring-DIM-mediated cell death, and salubrinal, an inhibitor of ER stress, inhibited cell death mediated only by 4,4′-dihaloDIMs. We found that although salubrinal did not inhibit the onset of ER stress, it prevented 4,4′-dibromoDIM mediated loss of MMP. Salubrinal potentiated cell death in response to 7,7′-dihaloDIMs and DIM, and this effect concurred with increased loss of MMP. Using in silico 3-D docking affinity analysis, we identified Ca2+/calmodulin-dependent kinase II (CaMKII) as a potential direct target for the most toxic ring-DIM, 4,4′-dibromoDIM. An inhibitor of CaMKII, KN93, but not its inactive analog KN92, abrogated cell death mediated by 4,4′-dibromoDIM. The ring-DIMs induced ER stress and autophagy, but these processes were not necessary for ring-DIM-mediated cell death. 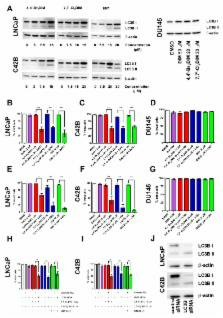 Inhibition of autophagy with bafilomycin A1, 3-methyladenine or by LC3B gene silencing sensitized LNCaP and C42B, but not ATG5-deficient DU145 cells to ring-DIM- and DIM-mediated cell death. We propose that autophagy induced by the ring-DIMs and DIM has a cytoprotective function in prostate cancer cells. NIH Image to ImageJ: 25 years of image analysis. For the past 25 years NIH Image and ImageJ software have been pioneers as open tools for the analysis of scientific images. We discuss the origins, challenges and solutions of these two programs, and how their history can serve to advise and inform other software projects. Each year, the American Cancer Society estimates the numbers of new cancer cases and deaths expected in the United States in the current year and compiles the most recent data on cancer incidence, mortality, and survival based on incidence data from the National Cancer Institute, the Centers for Disease Control and Prevention, and the North American Association of Central Cancer Registries and mortality data from the National Center for Health Statistics. A total of 1,660,290 new cancer cases and 580,350 cancer deaths are projected to occur in the United States in 2013. During the most recent 5 years for which there are data (2005-2009), delay-adjusted cancer incidence rates declined slightly in men (by 0.6% per year) and were stable in women, while cancer death rates decreased by 1.8% per year in men and by 1.5% per year in women. Overall, cancer death rates have declined 20% from their peak in 1991 (215.1 per 100,000 population) to 2009 (173.1 per 100,000 population). Death rates continue to decline for all 4 major cancer sites (lung, colorectum, breast, and prostate). Over the past 10 years of data (2000-2009), the largest annual declines in death rates were for chronic myeloid leukemia (8.4%), cancers of the stomach (3.1%) and colorectum (3.0%), and non-Hodgkin lymphoma (3.0%). The reduction in overall cancer death rates since 1990 in men and 1991 in women translates to the avoidance of approximately 1.18 million deaths from cancer, with 152,900 of these deaths averted in 2009 alone. Further progress can be accelerated by applying existing cancer control knowledge across all segments of the population, with an emphasis on those groups in the lowest socioeconomic bracket and other underserved populations. Copyright © 2012 American Cancer Society, Inc. Copyright statement: Copyright: © 2015 Goldberg et al. 3,3'-Diindolylmethane inhibits prostate cancer development in the transgenic adenocarcinoma mouse prostate model. 3,3'-Diindolylmethane enhances taxotere-induced growth inhibition of breast cancer cells through downregulation of FoxM1.